Front page article, 14 May 1931. 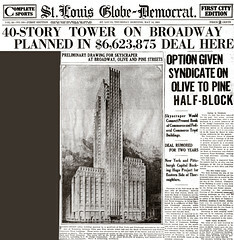 Front page article announcing forty story skyscraper by the architectural firm of Boyer and Armstrong published Thursday 14 May 1931. The Saint Louis Globe-Democrat newspaper presented a series of articles on the project over the next several days.